WAN Reports can be installed on any computer on the network that requires this feature. Compare store performance at a glance; the reports engine offers numerous reports, which can be displayed to screen or sent to a Microsoft® Excel file for further analysis and you have the option of reporting on single or multiple stores. As most retailers have their own unique requirements, reports can be designed specifically for you - Two Tongue Technology will assess customised reports on a case by case basis. The Aged Stock report uses the original goods received date and reports on stock older than the date specified. The Cashup Shortages report allows head office to view cashup shortages by store, staff member or payment type in detailed or summary versions over the period specified. The Cashup Transactions report shows transactions grouped by cashup across some or all stores by the period selected. The Commission report includes staff totals of commission and stock bonus on sales during the specified date range in detailed or summary versions. The Credit Notes report gives you a global view of outstanding credit notes, gift vouchers and deposits over the period specified across one or all stores in detailed or summary versions. Customer Export creates a list of all your customers depending on whether you select the Master List, Shopfronts List or Mail-out. Selecting Mail-out will create a list of customers with unique addressing details (surname, given names, company, address 1, address 2, address 3, suburb, state and postcode), across all stores. The exported text file created is compatible with Microsoft® Excel. The Debtors - Aged report gives you a breakdown of outstanding invoices and the aging period totals for the specified date range. The Debtors - Owing report displays all outstanding invoices for the specified date range in detailed or summary versions. The Debtors - Statement report displays all outstanding invoices as of the given cut-off date, for the selected customer(s). The Edit History report gives you a list of edits and their status including whether they have been implemented in the store's MYOB RetailManager database. This report can be used to inform the stores of any price changes that have occurred. The Laybys report displays all outstanding laybys for the date range specified across one or all stores. Net Purchases reports on the difference between goods received and goods returned over the period and suppliers specified. This report also displays Goods Received over the period and suppliers specified. And Returned Goods over the period and suppliers specified. The Order History report gives you a list of stock that has been ordered using the Head Office Ordering System. Period Sales reports on the Quantity Sold, Sales Inc $ or GP $ over a specified period of calendar years, financial years, months, weeks or days. The Profit By Categories By Shop report allows you to report on each shops profit or consolidated total sales across all shops, including or suppressing items not sold over the specified period. The Profit By Suppliers By Shop reports on the total profit by shop or consolidated totals across all stores for sales over a specified period. The Quotes report shows a list of outstanding quotes over the period specified. You can include or suppress quote details. The Sales By Tax Code report gives you a breakdown of sales over any period, grouped by shopfront or consolidated totals across all stores in detailed and summary versions. The Sales Demographic report lists custom answers for sales over the period specified. This report can be grouped by Shop or show Consolidated Totals. Blank answers can be included or suppressed. The Sales Orders report gives you a list of all outstanding sales orders for the date range specified including or suppressing sales order details. The Sales - Retail vs Account report gives you the retail sales verses account sales across your chain for the period specified and allows you to monitor whether accounts are being paid on time. The Sales Summary report gives you a complete breakdown of sales over any period, which can be grouped by staff, customer or shopfront, display the group totals or transaction details. The Sales Summary (inc Laybys) report gives you a breakdown of sales over any period and includes Takings, Laybys, Credit Notes, Gift Vouchers, Deposits and Sales Orders by one or more stores. Sales vs Stock allows you to compare your stock on hand verses sales for one or all stores including or excluding layby and sales order quantities. The detailed version gives you a breakdown of sales and stock on hand by shopfront. The summary version shows the consolidated totals, the average unit cost ex tax is included in the export text file. 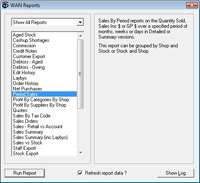 Sell Through reports on Quantities sold and received over a specified period and calculates the Sell Through % using one of three calculation types. Up to 6 levels of grouping are available in any order of preference. Sell Through FYTD reports on Quantities sold and received for a specified month and the relative Financial Year To Date (FYTD). The FYTD Sell Through % is determined using one of three calculation types. Up to 6 levels of grouping are available in any order of preference. Staff Export creates a complete list of all your staff from either the Master List or the Shopfronts List depending on your selection. The exported text file created is compatible with Microsoft® Excel. Stock Export creates a complete list of all your stock from either the Master List or the Shopfronts List depending on your selection. The exported text file created is compatible with Microsoft® Excel. With the 12-month historical Stock Movement report you can report on an individual or group basis. Stock On Order By Shop report gives you a complete list of what's on order for the period selected; you can include and exclude order details or show only the supplier totals. The Stock Ordering report gives you a list of stock that needs ordering across your chain by the suppliers selected, when a Maximum Quantity (Holding Quantity) is set in MYOB RetailManager. When "Use Min Qty (Threshold Qty)" is selected, items with a stock on hand quantity greater than the minimum quantity (threshold quantity) will be suppressed. When "Include All Items" is selected, the minimum quantity (threshold quantity) is ignored. Stock Received By Supplier is a consolidated goods received report using either the goods received date or the invoice date, grouped by supplier or stock over the specified date range and suppliers. Stocktake Shortages allows you to monitor stock movement due to Stocktake and Single Item Stocktake for one or more stores over the period specified. Style Movement is a Sales vs. Stock report by Style Number and is broken up by Colour and Size. This report is very useful for clothing and footwear retailers. The report filters include over a specified period by one or all styles and stores. Supplier Export creates a complete list of all your suppliers from either the Master List or the Shopfronts list depending on your selection. The exported text file created is compatible with Microsoft® Excel. The Takings Summary report shows takings from cashup to cashup across some or all stores by the period selected. What's Been Discounted across your chain allows you to see the item, amount discounted, related staff member and docket number to that transaction. Select the period specified, include or exclude discounts of less than 5 cents. What's In Stock lists the stock on hand for each store in detailed or summary versions. What's Selling lists the sales of stock items over the period specified, based on total quantity sold, total revenue and total gross profit. The What's Sold By Shop report gives you a breakdown of sales (including the customer name) over any period, which can be grouped by stock, supplier or staff. The Who's Buying report lists customers and the stock items purchased over the period specified. Primary grouping in this report is by Shop and Customer or Customer and Shop. Secondary grouping includes up to 4 levels of grouping in any order of preference.